Michigan Police Believed Larry Nassar's 'Lies,' Dropped Molestation Case An independent investigation finds that police failed to follow up on allegations made against the now-disgraced sports doctor in 2004. Meridian Township, Mich., has investigated why its police didn't pursue charges against Larry Nassar, seen in January 2018, when a young gymnast reported he had sexually assaulted her. Nassar, a physician for USA Gymnastics and Michigan State University, was sentenced to 40 to 175 years in prison in January 2018 after admitting he had sexually abused girls and women for decades. Meridian Township officials publicly apologized to one of Nassar's victims, Brianne Randall-Gay, a year ago and launched an investigation into how local police handled the complaint she filed in 2004 when she was 17. An 88-page report released Tuesday includes Randall-Gay's initial complaint filed the day after the alleged assault and a narrative of how Nassar molested her. 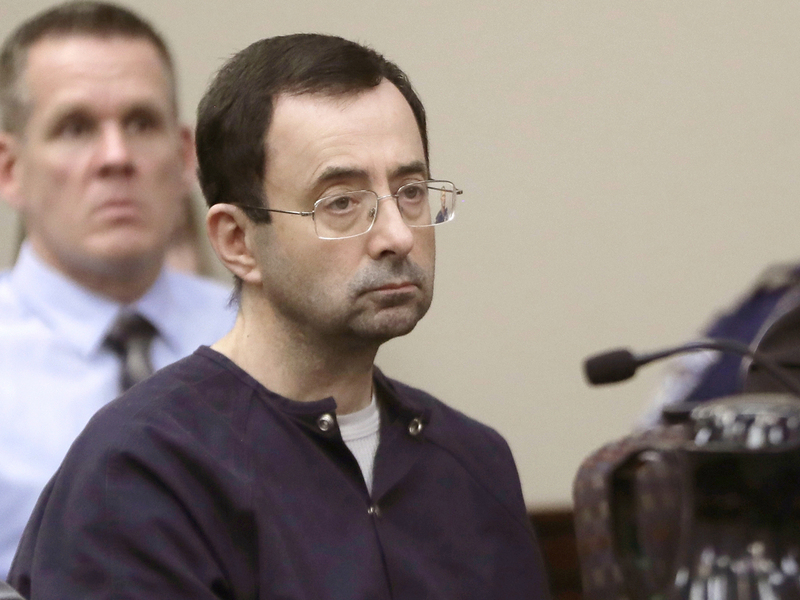 In a subsequent interview, Nassar told Detective McCready that he was treating Randall-Gay's scoliosis, a sideways curvature of the spine and that he was required to touch her lower back and upper leg region. In his summary of that interview, McCready says that Nassar gave him a Power Point presentation explaining the medical procedure. The 26-page printed presentation was written by Nassar. McCready acknowledged that he did not consult another medical expert, the report says, and never sent the Nassar case to the local prosecutor's office "because I believed his lies." The report says that of 14 investigations completed by McCready in his 2 ½ years as an investigator, the Nassar case was the only one he didn't refer for prosecutorial review because "he believed no crime was committed." He also said "it was 'not his best work,' " according to the report. The township's report was written in response to questions posed by Randall-Gay about how her case was handled. Near the conclusion it says Township Manager Frank L. Walsh made the decision not to discipline McCready for failing to pursue the case. "We can never let something like this ever happen again," said Meridian Township Police Chief Ken Plaga said in a news conference announcing the conclusions of the report written by Ken Oulette, an independent investigator selected by Randall-Gay. "I've talked to a number of people who have been sexually assaulted and one thing's clear, there is never closure," said Walsh at the same news conference. "And we don't expect this report to be closure for Brianne, but we do hope it's a pathway to healing for her." For her part, Randall-Gay, who lives in the Seattle region, expressed her gratitude towards the township for agreeing to the investigation and frustration with decisions that delayed the release of her records. In the end, she talked about her forgiveness, not for Nassar, but for McCready. "I have sympathy for Sergeant McCready and others involved in this case as I do not believe they had mal-intent," Randall-Gay wrote in a statement. "They made a mistake, a mistake that they will live with the rest of their lives. I offered my forgiveness in the past and I continue to extend my forgiveness to them."